Apple iRadio to feature "high quality sound"? | What Hi-Fi? Apple iRadio to feature "high quality sound"? Universal Music says high quality digital sound is the company's next focus and hints at new service around the corner – could Apple be about to launch a streaming service? Universal Music says high quality digital sound will be the next stage of the company's business, as it hints at a new music service that's just around the corner – which could be the long-awaited Apple iRadio. Paul Smernicki, Director of Digital at Universal Music, writing on the Telegraph website, said: "We’re now in a place where digital music and high quality sound work together. "This is the next stage of the evolution of our business and I’m excited about what’s around the corner." So what is Universal hinting is around the corner? The Verge reported that Apple hopes to launch its long-rumoured Apple iRadio streaming music service this summer, a Spotify/Rdio rival. Could it be that Apple's streaming service will look to major on high quality sound? Any new service could potentially involve Beats Electronics, too – a company which has previously hinted at working with Apple on hi-res music. Beats is set to launch 'Project Daisy', a new music service based on its acquisition of streaming service MOG, and Universal Music is a key investor. Last month Beats announced $60 million of funding for Daisy. Pulling the two stories together were reports that Apple CEO Tim Cook had met Jimmy Iovine from Beats to discuss the streaming music. Reuters reported Eddy Cue, a key player in setting up the iTunes Store, was also at the meeting. And its not the first time that Apple and Beats have been reportedly working together on hi-res music. Jimmy Iovine said back in 2011: "We're [Universal] changing our pipes to 24-bit. And Apple has been great. "We're working with them and other digital services – download services – to change to 24-bit. And some of their electronic devices are going to be changed as well. So we have a long road ahead of us." 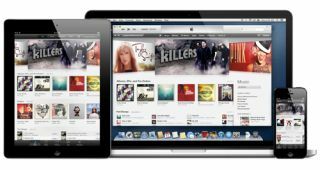 Last year we reported Apple was asking for hi-res music files for its iTunes service, and as far back as 2011 Apple was reportedly in talks over offering hi-res music. Back to now, and Smernicki made it clear that plans were afoot, saying Universal was waiting "for a few more of the dots to be joined". Will the dots join to become an Apple hi-res music service? Will Apple iRadio offer a jump in sound quality over Spotify? Will it all be powered by Beats Audio...? Let us know what you think in the comments below.